Nothing says fine dining like a fabric napkin. Whether it's folded nicely on a table, shaped into some kind of creative design or draped across one's lap, it shows a sense of sophistication and class. Made from 100% cotton, these square-shaped, elegant-looking dinner napkins are a definite five-star purchase. They bring refinement to any party. 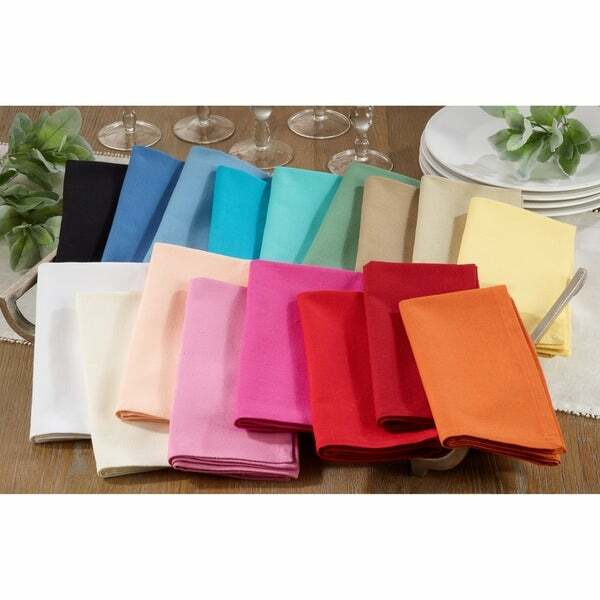 Have your guests dine in style with this set of twelve cotton napkins. These cloth napkins come in a beautiful, majestic color that complements any décor. Colors: Aqua, black, crimson, fuchsia, ivory, jasper green, khaki, orange, pink, periwinkle blue, red, rose, taupe, teal, turquoise, white, yellow. Dimensions 20.0 In. X 20.0 In. X 0.25 In. I got these napkins the other day and used and washed them. I was surprised. I have the white color and with a little bleach the stains of pasta sauce came out and they were not wrinkled at all. They looked nice on the table and it was nice not to have paper for a change. I would get these again in a fun color. I am an associate of overstock and was given these to test and leave an honest review. These napkins are good quality and reminds me of the kind you get in a restaurant. The hem around the napkin is about 1/2 inch which I like personally from an aesthetic stance. This review was written by a full-time Overstock employee. I received the product for free in exchange for my honest feedback. I am an overstock associate that was given these to try. They are great napkins and the color is perfect but they don't pick up a lot of water. They are like restaurant napkins. These match perfect with my table cloth. I felt the quality was great as well. *Please note I am an Overstock employee and was given this sample to review and leave an honest opinion.